If you're at all skittish about swimming in the ocean for fear that some mysterious sea serpent might be lurking in the depths, then you're not going to like a recent discovery off the coast of Portugal. 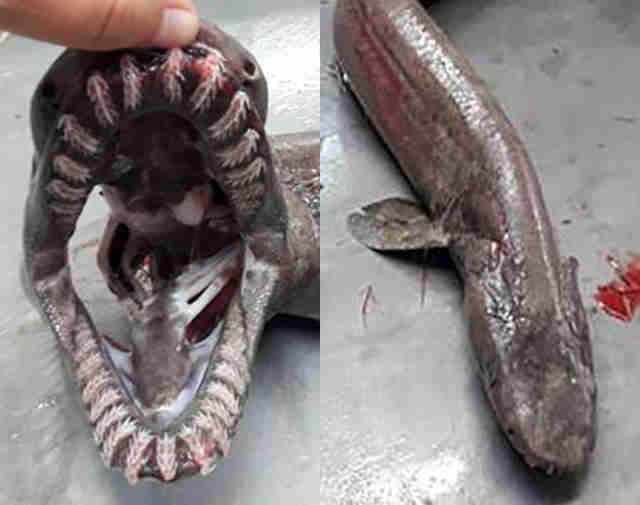 That's because scientists there captured a super-rare, snake-like frilled shark, and it's horrifying as all hell. During an unrelated European Union project this summer, a boat trawling the waters off the coast of Algarve ended up catching the five-foot long specimen, which boasts a signature slinky, snake-like body and face, and the sort of toothy jaw that can only be described as nightmarish. Frilled sharks have rarely been spotted in the wild, but they've been swimming the seas since dinosaurs roamed the Earth, and look the same now as they did then. In fact, because its features have remained relatively unchanged both inside and out for the last 80 million years, experts have come to refer to members of the species as "living fossils." 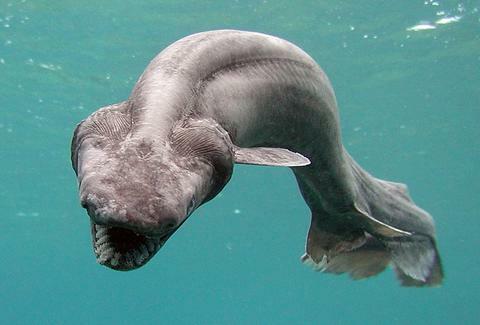 Average explorers and most researchers rarely ever see frilled sharks because they typically live way below the surface -- anywhere from 1,600ft and 3,300ft down. This particular frilled shark was picked up at depth of 2,300ft, where only a handful of deep-sea creatures can survive. Due to the great depth, their diet is pretty limited and consists primarily of cephalopods like squid and octopi, which they're particularly suited to catch with their whopping 300 teeth -- coiled in rows of 25 each -- via quick lunge attacks, according to professor Margarida Castro of the University of Algarve per a report from The Portugal News. They're known to swim in the waters off Scotland, Spain, Japan, Australia, and New Zealand, but it's incredibly unlikely you'd ever come across one since they live so deep down. Then again, you never know what weird sea creatures might just start making their way to beaches they don't belong near.